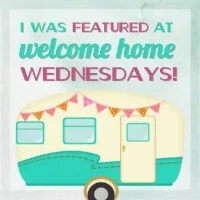 Welcome to Welcome Home Wednesdays #94!!! Wasn’t it nice to have a 3-day weekend? I feel like we got a lot done. The garden is planted, the yard is weeded and now it’s time to enjoy the backyard and sip this Watermelon Punch!! What did you do for the holiday weekend? Yeah! So excited to see our mini grad banner as your host pick! Thanks Erin, have a terrific week! Thanks for another great party! Have a great day. Thank you for hosting. I always look forward to this party. Enjoy your week! Thank you Erin for co-hosting the 94th Welcome Home Wednesday, appreicated. Thank you Erin for hosting. Hope your week is great. Yay! Thank you so much for featuring my backyard barbecue! Thanks so much for visiting and linking up with us!! Enjoy your day!